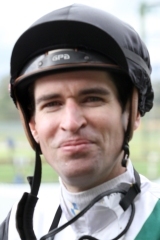 Steven Arnold certainly earned his winning riders percentage aboard Pins On Ice at Caulfield this afternoon. Positioned nicely in fourth place at the 800 metre mark, Pins On Ice lost her position when Dorsoduro and Winged Charm went around her before the home turn. Arnold had to use the whip on the home turn to get Pins On Ice going as she was left flat footed by the leading bunch. Gradually Pins On Ice ($2.25-$2.60F) made ground on the leaders all the way down the Caulfield straight, eventually getting home by a nose right on the line. Second was Winged Charm ($7.00-$8.00-$7.50) while only a short half head away in third place was Nakaaya ($3.20-$3.70). The win brought up the fifth for the last few days for trainer Danny O'Brien, who scored 4 wins at Sandown on Wednesday. "I did actually think she'd won", said O'Brien of the tricky finish where the first four horses went over the line locked together. "She was outside which always gives you an advantage in a photo." Today's win made up for Pins On Ice narrow defeat at her last start by Nakaaya, also a photo finish. "I thought she'd won last time but she didn't", O'Brien admitted. Like her grand dam Lake Lucerne, O'Brien is now looking forward to trying out Pins On Ice in Classic races in the Autumn. "I think she's really looking for 2000 metres", he observed. "She just kept winding into the finish and was strongest on the line." 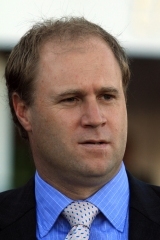 "If she can step out to 2000 and beyond she's a possible Oaks filly in the Autumn." Pins On Ice is another horse bred by the Chittick family at New Zealand's Waikato Stud. O'Brien has had a wonderful association with Waikato bred horses over the past few years. By Waikato's prolific winner getter Pins, Pins On Ice is out of the O'Reilly mare Ice Maiden, a winner at Caulfield and Moonee Valley. Ice Maiden's sire O'Reilly also stands at Waikato Stud as did her damsire Centaine. Ice Maiden's dam, Lake Lucerne was herself stakes placed in the Group 1 South Australian Oaks and is a sister to champion Kinjite, winner of more then $2 million and three Group 1 races. The family boasts stakeswinners such as Special Girl, Scaredee Cat, Hazard and Dazzling Diamonds.